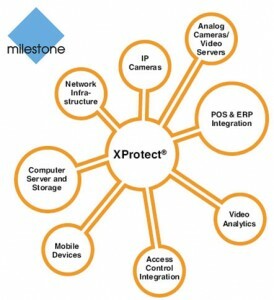 Milestone Systems is the world’s leading provider of open platform IP video surveillance software. are compatible with more IP cameras, encoders and digital video recorders than any other manufacturer. The DISC ArXtor Optical Libraries provide for centralized automated write-once storage and retrieval of Milestone XProtect video content and data. Providing 100% seamless integration as a standard Windows CIFS mapped drive share, the DISC ArXtor Optical Libraries are an ideal choice for evidentiary CoC and EDRM compliant long-term storage requirements. Each ArXtor Library can either be rack-mounted or free-standing and is available in a variety of capacity and frame sizes to meet your unique storage needs. The ArXtor Appliance can be integrated seamlessly into any existing GigE network infrastructure, providing network connectivity to all XProtect clients over a GigE LAN with no local client agents required. Each Blu-ray Disc generated by the ArXtor Archival System is UDF-compliant and can be read on any Linux, MAC, Unix or Windows client without requiring any specialized software. Each ArXtor Library comes integrated with your choice of 50GB or 100GB BDXL automation-ready Blu-ray drives. Simultaneous BD/CD/DVD mixed media is also supported to meet any data set requirement.